Many Glacier Hotel, Glacier NP, 1985. Included in this Landmark nomination are the major remaining structures left from the Great Northern Railway developments within the boundaries of Glacier National Park: The Many Glacier Hotel, Sperry and Granite Park Chalets, and the Two Medicine Chalet (now the Two Medicine Store). The hotel is used seasonally as a major tourist hotel; Sperry and Granite Park Chalets are backcountry developments used seasonally by hikers and trail riders. The Two Medicine Store is open seasonally as a campers' store. Outside the park boundaries and thus outside the scope of this project are the Belton Chalets and railroad station at West Glacier and the Glacier Park Hotel complex and railroad station at East Glacier--all part of the same Great Northern story and excellent examples of chalet style architecture. Landmark status for these structures should be pursued. The Cut Bank, Goathaunt, Sunpoint, St. Mary, Gunsight, Many Glacier Chalets and one of the Two Medicine Chalets no longer exist. The largest structure of the entire group is the Many Glacier Hotel on the edge of Swiftcurrent Lake in the northeastern quadrant of Glacier National Park. The enormous building with its multiple wings and additions stretches a great distance along the lakeshore. The building is up to four stories in height and designed as a series of chalets. Principal building materials are stone for foundations and the basements walls of the original wing, with wood-frame superstructures. Of particular note is the stone basement walls of the basement story of the original portion of the building. The rugged texture of the rough rubble masonry and the segmentally arched openings add considerable interest to the structure. The exterior walls are finished with brown-painted wood siding. Windows are framed with moldings cut in Swiss jigsawn designs. The principal moldings and window frames are painted white with additional yellow jigsawn detailing. Considerable variation appears in the rooflines. The gable roofs often have clipped-gable ends. Multiple dormers and hip roofs add further interest to the rooflines. The roofs are all finished with wood shingles. Each wing of the hotel has balconies, many of which now serve as fire escapes. The balcony railings are wood, sawn in jigsawn patterns found in chalet architecture. The original wing of the hotel--now the center of the hotel--was constructed during 1914 and 1915. Annex Number 1 to the north containing more guest rooms and the dining room and kitchen was constructed shortly afterwards. Annex Number 2 was constructed in 1917 south of the original section and connected to it by a spire-topped enclosed breezeway. In the 1950s the porte-cochere at the entrance was built, topped again with a spire similar to that of the breezeway at the south. During that same remodelling the kitchen facilities were updated, bathrooms were added to all of the guest rooms, and the original spiral staircase that led from the lobby to the basement was removed to create a lobby space for a gift shop. The exposed ceiling in the dining room also was covered with a suspended ceiling. The interior of the building continues the Swiss alpine theme established on the exterior. The lobby, the most impressive space of the building, has four stories of balconies surrounding its rectangular edges. The balcony railings again are patterned after Swiss designs. Enormous logs supporting the balconies and portions of the roof structure extend from the floor of the lobby to the ceiling. The peeled logs are topped with capitals that give the building a formal, classical air. A round copper fireplace with a painted metal chimney stack is at the north end of the lobby, suspended by cables from the wood structural system. The south end of the lobby space contains the gift shop, of new construction. Most of the interior walls in the public spaces have a board-and-batten wainscotting with a painted wall finish (fiberboard) battened in rectangles above. Doors to guest rooms have exposed reinforcing of X-patterned wood slats, with one "X" above the other like dutch doors. Small red and white painted crosses similar to the Swiss flag have been tacked on each door. The building's Swiss feeling remains in the architectural elements and is reinforced by the decor. Placemats on the tables in the large dining room still promote this " . . .Alpine hostelry. . .in the Switzerland of North America. . .The hotel boasts a true Swiss atmosphere from the Alpine beauty which surrounds the building to the decor of the striking lobby." The remaining chalets inside the park boundary are scattered in the central and eastern portions of the park. Note that the use of the term "chalet" refers in a general sense to the remaining buildings of the chalet complexes. However, the term is also applied to specific structures of differing functions in each of the chalet complexes at Sperry and Granite Park. The northernmost of the chalets is at Granite Park and is reached by hiking trails. Granite Park chalet development, constructed in 1914, consists of a dormitory and a "chalet" used as dining hall, resident living quarters, and guest rooms. Both the dormitory and the chalet are included in this nomination. The complex is below Swiftcurrent Pass at the edge of a sub-alpine meadow with scenic views of the McDonald Valley, the Livingstone Range, and the southern areas of the park. The chalet is the largest of the two structures and is a two-story building with a gable roof. The chalet was designed by architect Samuel L. Bartlett. The building is rectangular in plan, with two additions--one of stone and one of log construction added on the back. Other additions at the rear of the building that were constructed in 1924 have been removed. The gable roof is built of pole rafters and 1" decking exposed on the interior and finished on the exterior with wood shingles. The native stone walls of the building are of random rubble masonry bonded with cement mortar. Window and door openings have keystoned lintels with slight arches. The front elevation of the building is symmetrical and overlooks the most scenic vistas. The two-story porch of log construction on the front elevation provides a shaded spot for hikers to rest on the ground floor, and access to guest rooms above. At the rear of the building another two-story porch between the two additions is used as a service porch for the kitchen while the staircase provides access to additional guest rooms above. All of the logs used in the building are of local origin. Doors into the building are tongue-and-groove set in herringbone patterns. Most of the windows are multi-light casements. The first floor of the building houses the dining room, kitchen, bedroom, storeroom, and small bathroom. The second story contains simple guest rooms and employee quarters. Interior floors are flagstone on the first floor and wood above, and interior partition walls are vertically placed half logs. The flagstone used in the floors retains sedimentary ripple marks from the natural formation. The log joists of the second story extend through the stone walls and serve as the joists for the front and rear porches. The dormitory is a smaller one-story structure of stone construction, built in 1913 and designed by architect Thomas D. McMahon. The rubble masonry of the walls has the same rough texture as that of the chalet. The roof is finished with wood shingles. The dormitory is divided into a series of six separate bedrooms, partitioned by interior log walls. The floors are flagstone. The ceiling is plank decking. The door and window openings have slightly arched lintels, harking back to the character of the stonework in the adjacent chalet, in the Many Glacier Hotel and in Sperry chalet. The building has a bumble, yet identifiable character. Two changes to the historic scene are the stone-veneered comfort station (1965, 1975 addition) and a small composting pit toilet, both of more recent construction. The two buildings of the Sperry chalet complex are the dormitory and the dining hail. The chalet development is reached only by trail, just as Granite Park is. The complex sits in a glacial cirque, surrounded by enormous peaks where the geology is readily exposed by the lack of vegetation in the steep, sub-alpine region. The largest and most architecturally impressive structure of the two is the dormitory, covered by a large gable roof pierced by two dormers on each side of the gable that shelter small log- framed balconies. The roofs are finished with wood shingles. The random rubble masonry of the walls have some stones that extend up to a foot out from the rest of the wall in distorted shapes in the way that clinker bricks extend out from brick walls. On the corners of the structure the quoins alternate in their extensions out from the walls in the way that log ends extend. This use of materials adds a textural ruggedness. Window and door openings again have arched lintels, reminiscent of the other Great Northern buildings. One of the gable ends of this structure has the letters "G.N.Ry." --standing for Great Northern Railway--laid out in light-colored stone that contrasts with the redder stone of the rest of the structure. The building contains 23 guest rooms, reached by a first floor lobby access and interior staircases. Interior partition walls are cedar tongue-and-groove boards set in between the structural log framing. Ceilings are the same material. Floors are wide boards, painted grey. The rustic railings of the interior staircases and exterior balconies are peeled logs. The existing balconies and the deck along the west side of the structure are not original. The original balconies deteriorated badly and were removed and replaced with the present balconies in 1978-79. The building was designed by Cutter and Malmgren and constructed in 1914. The stonework, arched fenestration, and the log detailing in the brackets and balconies give the building a quality of design and character unique to a backcountry structure. The kitchen building for the Sperry Chalet development is a simpler stone structure that is rectangular in plan. The rubble masonry has stones of considerably smaller sizes than those used in the dormitory and lacks the exceptionally fine design quality, but it does serve its purpose in its simplicity. The gable roof of the low, rectangular structure is finished with wood shingles. A small deck of recent construction wraps around the south and west exterior walls, overlooking beautiful views toward Lake McDonald, about seven miles to the west. The window and door openings again have the gentle segmental arches which immediately identify the structure as a Great Northern building. Some of the kitchen windows are covered with "bearproofing" grates of long wood strips with the three exposed sides covered with the business ends of large nails to discourage the local grizzlies. The interior of the building, like its exterior, is of simple design. The stone walls remain exposed on the interior, as are the simple roof trusses. The original roofing system was of peeled lodgepole pine, but it was replaced in recent years. The floors are varnished wood. Partitions for the kitchen space are of beaded tongue-and-groove siding on wood frame walls. The east wall of the building contains a fireplace. The building was constructed in 1913. The last of the remaining chalet developments within the boundary of Glacier National Park is the Two Medicine store, formerly the dining hall for the Two Medicine Chalet complex. Unlike the other stone chalet buildings, Two Medicine was of log construction--and is the only one remaining of a series of log chalet buildings. The enormous log structure is generally rectangular in plan. The main roof is a gable with clipped ends and shed roofs of varying angles projecting directly out of the roof ridge. The roof is finished with wood shingles. The symmetrical front elevation at the south gable end had a two-story log porch. The second story of the porch is reached only from the interior of the building. The structure's log walls are stained a deep brown. Moldings around the multi-light wood frame windows are painted white. On the interior the building retains its original configurations and most of its original finishes. The log roof structure is exposed and the log walls retain their original light-colored cement chinking. The large open room, formerly the main dining hall, hall, still has one original set of table and chairs, while the other furnishings for the new snack bar are of recent origin. The small balcony overlooking the main room and with its staircase providing access to the upstairs employee rooms has a peeled log railing. The original kitchen area is used for storage and as part of the kitchen area for the new snackbar. The original wood floor is covered with linoleum tile. The building was designed by architect Samuel Bartlett and has changed very little since its construction in 1914. The development funded by the Great Northern Railway in Glacier National Park is unique in National Park architecture. The Great Northern, under directions from its President Louis Hill, chose a distinct architectural style--the Swiss Chalet--and constructed all of its development within the park in that style. The buildings that remain are one of the largest collections of Swiss chalet structures in the United States. Also, Hill's ideas for his railroad's development within the park was based on a European type of system where major resort hotels were linked with backcountry chalets by a system of hiking and riding trails. This system was the first of its kind in a national park. What remains of the system is still in use. On a regional level of significance, Hill's assistance in the construction of roads and trails in the park was a substantial contribution to the development of Glacier National Park. Granite Park chalet has additional local significance in park history and folklore as the location for some of the events of a night in August, 1967, when two young women were killed in the park by grizzlies--the first such documented incidents to happen since Glacier was established as a national park. The isolated incidents occurred at Granite Park and at Trout Lake, about ten miles apart. A grizzly killed one woman at Trout Lake. That same night a grizzly--believed to be a different bear than the Trout Lake bear--mauled a young man and killed a woman at Granite Park, within a very short distance of the chalet. Reporter Jack Olsen documented the incidents in his fast-paced, dramatic book Night of the Grizzlies. Glacier National Park was established in 1910, pushed through the legislative process under the considerable influence of the president of the Great Northern Railway, Louis Hill. Hill's railroad ran along what became the southern edge of the new park. Following the pattern set by the Northern Pacific in Yellowstone and the Atchison, Topeka, and Santa Fe at Grand Canyon, Hill knew that the creation of a destination resort at his park would tremendously increase revenues from passenger traffic on his main lines. The Northern Pacific in 1903 had funded the construction of Old Faithful Inn at Yellowstone. The Atchison, Topeka, and Santa Fe had financed El Tovar, Hopi House, and Hermit's Rest at Grand Canyon. What both of those railroads had done, and what Hill wanted to accomplish, was to build resorts in architectural styles that would create images--buildings that would be noteworthy and memorable in their own right. All of the railroads used architecture as a marketing strategy to enhance the visitors' stay at these scenic wonders. Distinctive architecture contributed to the sense of place, and these "places" could be reached in comfort only by rail. While working on establishing Glacier as a national park, Hill promoted the area as the "American Alps." To him, it was only logical that the single architectural theme befitting the new park was the Swiss Chalet style. Between 1910 and 1915 the Great Northern Railway and its wholly-owned subsidiary, the Glacier Park Hotel Company, constructed two enormous luxury hotels and a series of backcountry chalet developments. The major hotels, the Glacier Park and the Many Glacier, were the core structures. The chalets of log and stone construction, and informal tent camps were placed in the backcountry within an easy day's ride or hike of either one of the major hotels or of each other. Following the European manner of chalet development was a new twist to railroad developments in national parks (or areas soon to be designated as national parks). The Northern Pacific's development at Yellowstone included only one architecturally remarkable structure--Old Faithful Inn. Their other hotels were, for the most part, directly out of the mainstream of contemporary American hotel design, and access to all of them was by stage from the railroad terminal. The Santa Fe pursued a tremendous variety in their architecture. They built a handsome log depot, a "Norwegian-Swiss" hotel (El Tovar), with a duplicate of a Hopi Pueblo within one hundred yards. But again access was relatively sophisticated. The Great Northern development at Glacier used one architectural theme and extensive backcountry development that encouraged the visitors to leave the luxury of the enormous hotels and experience the American alps by more rustic means. Hill's choice of not only a style, but also a system, gave an enormous architectural unity and sense of place to an entire region of immense proportions, rather than creating an identity in a single small niche of a park. Hill's system of chalets has suffered over the years. Some of the chalets were demolished and others were destroyed by avalanches. The buildings of his elaborate system that remain within the park--the Many Glacier Hotel, the Sperry and Granite Park Chalet developments, and the Two Medicine Store--are exceptional examples of that architectural system that still create that alpine character of Glacier National Park. Buchholtz, C.W. Man in Glacier. West Glacier, Montana: Glacier Natural History Association, 1976. Glacier Park Foundation. 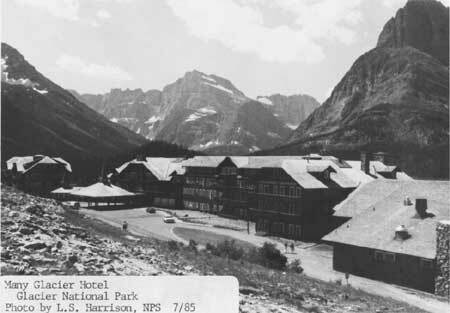 A History of Many Glacier Hotel. Minneapolis: Glacier Park Foundation, 1985. Law, Henry G. Historic Resource Study, Part II (Architectural Survey), Glacier National Park, Montana. Denver: National Park Service, 1977. McMillon, Bill. The Old Hotels & Lodges of Our National Parks. South Bend, Indiana: The Icarus Press, 1983. Newell, Alan, David Walter, and James R. McDonald. Historic Resources Study, Glacier National Park and Historic Structures Survey. Denver: National Park Service, Denver Service Center, 1980. Runte, Alfred. Trains of Discovery: Western Railroads and the National Parks. Flagstaff: Northland Press, 1984. Tweed, William C., Laura E. Soulliere, and Henry G. Law. National Park Service Rustic Architecture: 1916-1942. San Francisco: National Park Service, Western Regional Office, 1977. Many Glacier. The boundary, as shown on the enclosed sketch map, begins at the intersection of the Boat Storage Access Road approximately 90 feet south of the south wing of the hotel, then proceeds due west 100 feet to the lake shore, then follows the shoreline in a northerly direction to a point 100 feet north of the north wing of the hotel, then due east to the eastern edge of the Hotel Access Road, then following the access road to the intersection of the Boat Storage Access Road, then following the southeast edge of that road to the starting point. Granite Park. The boundary, as shown on the enclosed sketch map, is a rectangle, measuring 150 feet x 240 feet, with its southwest corner 35 feet southwest of the southwest corner of the chalet and its northwest corner 60 feet northwest of the northwest corner of the dormitory. Sperry. The boundary, as shown on the enclosed sketch map, is a rectangle measuring 520 feet x 160 feet, the southeast corner of which is 100 feet from the southeast corner of the Sperry chalet dormitory and the northwest corner of which is 60 feet from the northwest corner of Sperry chalet dining room. Two Medicine. The boundary is a rectangle measuring 150 feet x 200 feet centered on the store.